In this article, we would like to introduce to you top natural home remedies for blemishes that cost you little money as well as bring to you lots of benefits to skin care. For both men and women, skin plays an important role in your appearance, especially facial skin. So it is necessary to remove those blemishes as soon as possible. Blemishes is commonly known as the dark spots or discolored areas which appear on your skin, besides this term can be used to indicate the whitehead or blackhead problem. In fact, blemishes may happen to any part of your body such as back, arms, neck or legs. But above all, it is unsightly and embarrassed when your face gets some blemishes. As you should know, skin prevents the dangerous factors from invading your body and keeps the vital elements inside. Along with the protective effects, your skin is also considered as a shield against the harmful impacts of ultraviolet radiation. Therefore, anything that damages the skin and causes the change in its condition, will interrupt the function of your skin. In regard to this problem, the blemishes can affect your overall health, so you need to take good care of it quickly. One of the key reasons for blemishes is the acne breakouts which commonly associate with teenagers. Moreover, other possible reasons can be the bad lifestyles, deficient diet combining with poor skin care, hormone disorders or overuse of beauty products. On the other hand, the natural causes are perhaps the aging and gene as you are born with flat birthmarks. In details, blemishes have various sizes and shapes, some are small that makes you unconcerned about them, but some are quite big that totally will be noticeable. Furthermore, they mostly occur on your face that makes you feel less confident and uncomfortable. If you are seeking the way to deal with blemishes and improve the health of your skin, luckily this article can help you out with top natural home remedies for blemishes. 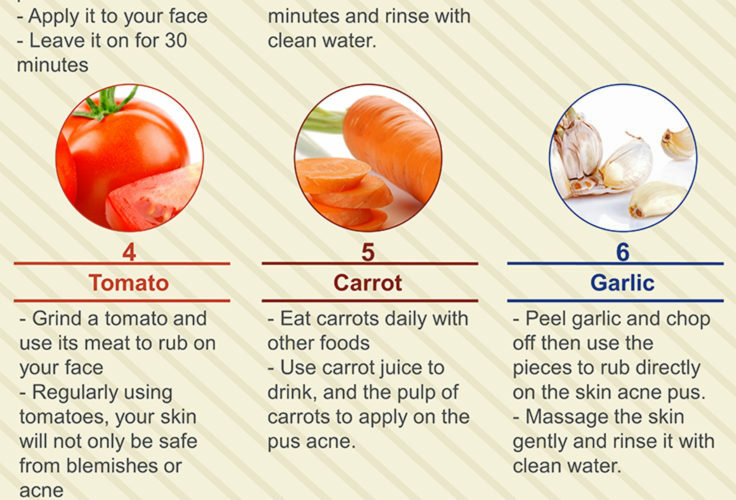 You can easily try the following tips right at your home so as to get rid of them and recover the healthy skin. The first home remedy we want to show you to fight against blemishes is lemon juice. With the bleaching agent, lemon juice has ability to brighten discolored skin and cover the blemishes, dark spots. It is really friendly to your skin and helps you restore the fair skin fast. Repeat this solution 2 – 3 times per week until the blemishes are disappeared. Tomato is considered as an effective home remedy for blemishes that contains a great deal of vitamins and minerals. It has many useful health benefits to your body, particularly skin care because tomato stimulates skin growth and brightens affected skin. Additionally, it cleans the clogged pores as well as relieves the symptoms of blemish. Keep doing this useful solution as needed. Cucumber is one of the most wonderful tips on how to get rid of blemishes, it helps you restore healthy skin and prevent the harmful elements from entering your body. Besides, the great sources of vitamins and antioxidants in cucumber will soothe the inflammation and remove blemishes. Prepare some slices of cucumber and place it on your whole face. Then clean your face after half an hour. Repeat this home remedy twice per day until there is improvement. Another option is the cucumber juice. You need to combine the juice with some oatmeal and put it directly on the affected area. Wait for 20 minutes and wash it off. It is recommended that you should use this tip daily to improve the skin health. If you are facing with blemishes and find the way to remove them, you should not forget aloe vera. It is packed with essential vitamins and nutrients that makes it become a useful solution to blemishes. Banana is outstanding in the list of top natural home remedies for blemishes. Because it is not only a delicious food but also has positive impacts on your skin. Obviously, it moistens your skin, clears the dust along with dead cells from your obstructed pores and reduces the inflammation. Plus, daily banana intake will boost your overall health to remain a beautiful skin. Generally, you should use the ripe banana instead of immature one to get a better result. Repeat this solution for several times a day to fight against blemishes.